A dam built by the Mammoth Spring Milling Company in the late 1880s is one of the major attractions at Mammoth Spring State Park. 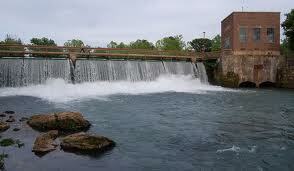 Mammoth Spring, Arkansas, (population 977) was founded in 1883 at the head of the Spring River in the Ozark Mountains. An early grist mill powered by the spring’s water contributed to the town’s growth. With the coming of the railroad and construction of a dam by the Mammoth Spring Milling Company later in the 1880s, the town flourished. The Arkansas-Missouri Power Company bought rights to the dam in 1925 and constructed a hydroelectric plant that provided electricity to the area until 1972. In 1957, legislation established Mammoth Spring State Park, and the dam, listed on the National Register of Historic Places, is one of the park’s major attractions. Another is the 1886 Frisco Depot, also listed on the National Register. It was restored in 1971 and now functions as a repository for artifacts and memorabilia related to the railroad and the spring area. Fourteen life-sized human figures portray travelers, station hands, and train crew, and two short videos tell of the life and times of the booming city of Mammoth Spring. The former St. Andrew’s Episcopal Church, built in 1888, also appears on the National Register. The City of Mammoth Spring acquired and restored the Gothic-style structure, which is now used as the town courthouse and for weddings, receptions, and other events. Mammoth Spring takes pride in its role in the creation of the Grand Old Opry, the longest running country music show in the United States. A reporter named George D. Hay visited the town in the early 1930s and sat in on a group of country musicians playing, singing, and dancing. Later, Hay worked for WSM radio and, as he recounts in his history of the show, that experience in Mammoth Spring inspired him to begin the Grand Old Opry. The town celebrates Solemn Old Judge Day every Labor Day Weekend to celebrate Mammoth Spring’s role as the inspiration for the Opry. (Hay used to refer to himself as Solemn Old Judge in his newspaper columns and on WSM.) A play about Hay’s experiences, music, crafts, and an antique car show entertain several thousand participants each year. Another local heritage celebration is the Soldiers, Sailors, Marines, and Air Force Reunion, which started 125 years ago as a Reunion of the Blue and the Gray. The Civil War split many residents, even families, in the area, as they chose different sides to support in the war. The reunion was begun as a way to heal those divisions. Over time, other branches of the service were added so that anyone who fought for America’s freedom or for the rights of others could meet for a week of fun and celebration. Now sponsored by the Veterans of Foreign Wars, the event includes a Civil War Encampment and draws hundreds of tourists each year. Designated a Preserve America Community in May 2011.